Do you really care if 1.2 GHz HFC networks can carry full-blown DOCSIS® 3.1? – We have moved – Follow us on www.telestehub.com! Do you really care if 1.2 GHz HFC networks can carry full-blown DOCSIS® 3.1? Many care, yet only few require – although everybody should rememBER. Cable TV industry talks about DOCSIS 3.1. It brings salvation, has an extremely effective forward error correction and supports 4k QAM. Funnily enough, as always, the devil is in the details. While everybody talks about gigabits, there is one minor detail that may turn gigabits into megabits. After all, BER (Bit Error Ratio) is the only thing that matters. Whatever happens in the network, BER is the king and deserves respect. BER allows us to discuss output levels of active coaxial products in a similar way. 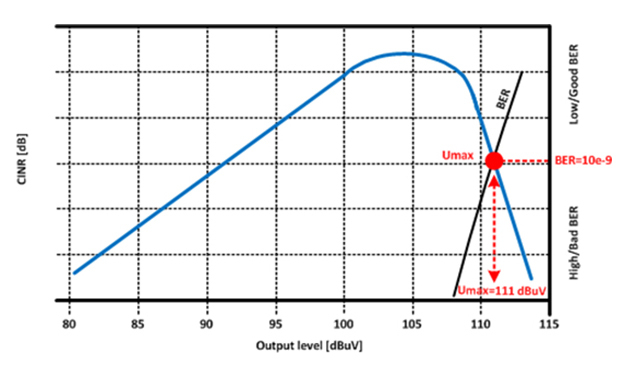 Umax is the maximum output level at the highest used frequency at full digital loading when BER is still better than 10e-9. Standard EN/IEC 60728-3-1* defines how active coaxial products should be measured. It specifies that Umax is measured with 112 channels that load up to 1006 MHz while the modulation method is 256QAM (DVB-C). Today the measurement method of the maximum output level of the HFC network elements is specified up to 1006 MHz and Teleste strongly advises users to measure even as high as 1218 MHz. This is the best way to understand how a network behaves when DOCSIS 3.1 roll-outs take place. The standard has been defined in order to make a comparison of active coaxial products easy and realistic. How is it that the cable TV industry is not discussing this? Hopefully, this situation will change quickly because we want all forthcoming HFC networks to support DOCSIS 3.1 up to 1218 MHz. Gigabit promises shouldn’t turn into compromises.